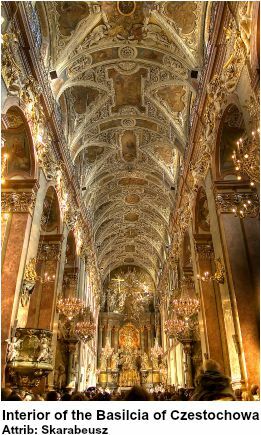 In the monastery-fortress of Jasna Gora, in Czestochowa, Poland is venerated an ancient icon of Holy Mary and the Infant God, with a fascinating history. Tradition has it that it was painted by St. Luke the Evangelist on a table built by Our Lord Jesus in St. Joseph’s workshop. Empress Saint Helena who found Our Lord’s cross, also discovered this icon in Jerusalem, and took it to Constantinople where her son, Constantine, built a church to enshrine it. The image remained in Constantinople for 500 years until, through dowries, it was taken to Russia to a region that later became Poland. This icon, now known as Our Lady of Czestochowa, has an embattled history. While still in Constantinople, placed on the wall of the city, the icon so frightened an army of besieging Muslims that they took flight. In the 15th century, the polish king Saint Ladislaus installed the holy image in his castle. Tartar invaders besieged the castle and an arrow pierced the image in the region of the throat, leaving a scar. Interestingly, repeated attempts to repair the damaged painting failed. The scar always reappears. Wishing to protect the icon from subsequent attacks, Saint Ladislaus took it to his town of birth, Opala. On the way, he stopped at city of Czestochowa to rest, placing it in the wooden church of the Assumption in the nearby place of Jasna Gora (Bright Hill). In the morning, the horses pulling the carriage containing the icon refused to move. Taking this as a sign, St. Ladislaus re-installed the image in the church of the Assumption and confided sanctuary and monastery to the Pauline Fathers. It was on this day, August 26, 1382 that Saint Ladislaus established the feast of the Madonna of Czestochowa and it is still observed today. Next, the Hussites, followers of the heretic John Hus from Prague, attempted to harm the holy icon. In 1430 they stormed the monastery and stole the image. Placing it in a wagon, they were carrying it away when the vehicle stopped and could not be moved. The attackers hurled the image to the ground, breaking it in three pieces. One man pulled his sword and struck the image twice on the cheek leaving two deep scars. On attempting to slash it thrice, the man went into agonizing convulsions and died. 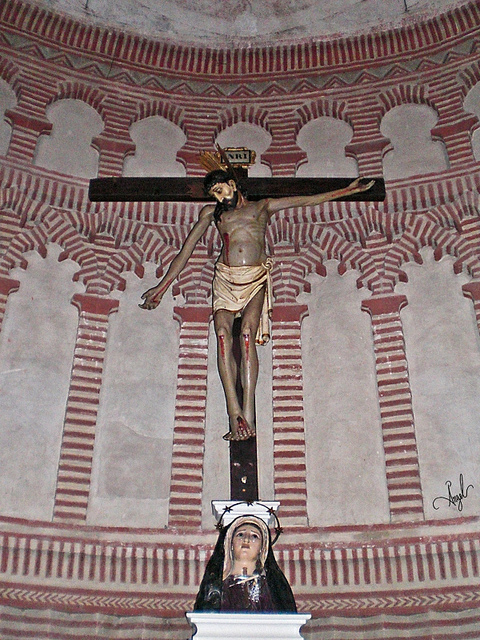 The two scars on the holy image as well as the one on the throat have always reappeared after attempts to repair them. The holy icon’s great epic was the Siege of Czestochowa in 1655 when an army of 12,000 Swedish Protestant invaders led by a General Miller, attempted to take the monastery-fortress of Jasna Gora. The year before, a vision of a scourge in the face of the sun had been seen over the area. 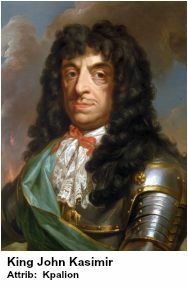 Indeed, King Karl Gustav, and the Swedes invaded and conquered most of Poland with the help of Calvinist Polish nobles, ousting King Jan Kasimir. One monastery, led by a heroic prior, Fr. Augustine Kordecki, refused to surrender. Taking in five Catholic Polish nobles, the monastery resisted with only 300 men. The besieged faced treason, threats, and numerous assurances of the enemy’s “good will” in attempts to seduce them into an inglorious “peace”. 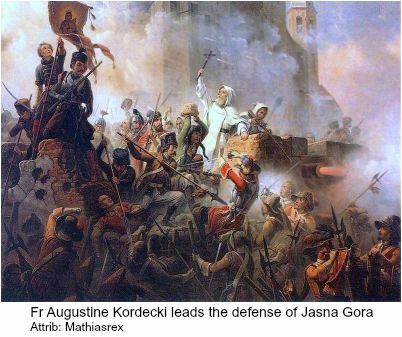 But placing their full trust in Our Lady, whose image they guarded, the monks answered, “Better to die worthily than to live impiously.” Thus began the 40-day siege, and nothing was spared to bring down the walls of Jasna Gora. Meanwhile, the forty monks and the besieged prayed before the Holy Icon of Czestochowa. They prayed and fought, fought and prayed. And a mysterious “Lady”, dressed in a white or blue mantle, whom the Swedes called a “witch” began to appear on the ramparts, herself supplying the canons. The sight of her terrified the invaders. A mysterious fog also enveloped the holy hill, which at times gave the illusion of the monastery-fortress being higher, at others lower, the result being that the canon-balls missed their target. Finally, the mysterious lady appeared in the night to General Miller himself. After procuring a copy of the icon of Czestochowa, Miller said, "It is absolutely not comparable to that virgin who appeared to me; for it is not possible to see anything comparable on earth. Something of the celestial and divine, which frightened me from the beginning, shone in her face." In the end, spooked and discouraged by these supernatural occurrences, the Swedes lifted the siege. From the victory of Czestochowa, the Poles again took heart, and rallying around King Jan Kasimir, took back their country. The next year, in the presence of the clergy, nobility and people, King Kasimir solemnly proclaimed Our Lady of Czestochowa Queen of Poland. Recognizing that Poland had been chastised for its sins, and oppression of the less fortunate, He promised to rule with equity. In 1920, when the Russian army assembled at the River Vistula, the Polish people had recourse to their Madonna. The Russians quickly withdrew after the image appeared in the clouds over Warsaw. In Polish history, this is known as the Miracle of Vistula. During the Nazi occupation of Poland in WW II, Hitler ordered all religious pilgrimages closed. In a demonstration of love and trust in Our Lady, half a million Poles defied Hitler’s orders and visited the shrine. Following the liberation of Poland in 1945, a million and a half people expressed their gratitude to their Madonna by praying before the miraculous image. Twenty eight years after the first attempt to capture Warsaw, the Russians took the city. 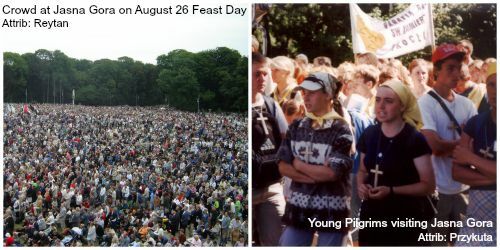 That year 800,000 visited the Lady of Czestochowa in defiance of the invader. And today, free from Communism, Czestochowa continues to be the religious heartbeat of Poland. To the miraculous, fearless Lady of Jasna Gora, the Polish go with their needs and petitions, their sorrows and their joys. Indeed she is their embattled, victorious, miraculous queen.